I’m sure I’m seeing more and more plastic toys with flashy lights, wailing sirens and things that move or swing. Whatever was used to entertain the masses before the arrival of the battery? Time to go back to basics. For a toy that will last many years, never go out of fashion and be well played with, look no further than a set of simple wooden blocks! 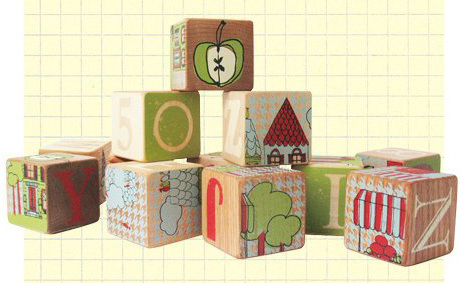 Petit Flaneur has extended the life of their Bok wooden block set by adding a puzzle element. Older kids can now get a kick out problem solving by matching the beautifully screen printed blocks to form a gorgeous three dimensional print. Each block also features a symbol for a great tic-tac-toe game. For the younger set, there’s all the usual rough and tumble of playing with blocks and that wonderful sound of wooden blocks being knocked together with delight. Made from reclaimed hardwood, all blocks are screen printed by hand with great detail and the edges are all sanded, with corners rounded for added safety. 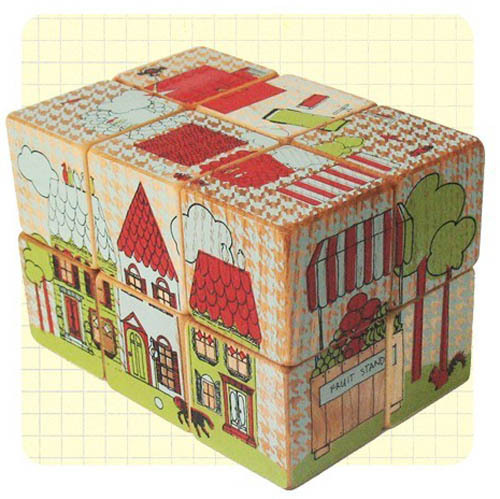 The Petit Flaneur Bok wooden block set is available from Petit Flaneur’s Etsy store for US$64 plus an extra US$6 shipping to Australia.